Aerial images of the Great War give an insight into the conflict only matched by the panoramas taken at ground level by the Royal Engineers. Aerial imagery was made by the Royal Flying Corps using cameras normally fixed to the side of the aircraft and developed with the print being the same size as the very large glass negative, giving it incredible resolution. Such images are often so clear that even human beings can be picked out on some photographs. This image taken of the Bellewaarde Ridge in July 1917 – just prior to the Third Battle of Ypres – shows the level of destruction in the Ypres Salient by this time. 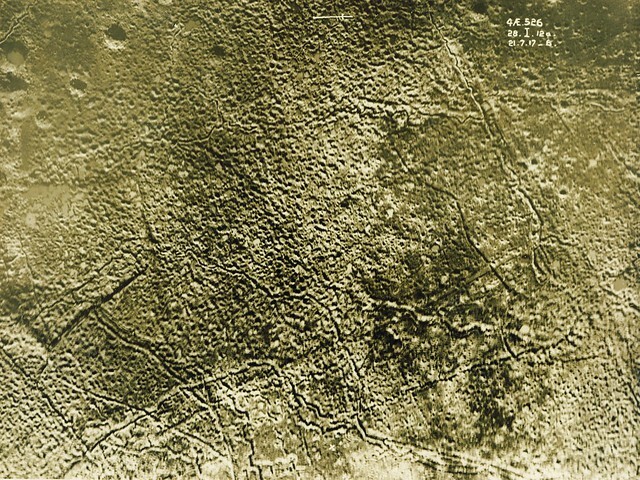 Part of the old Menin Road is visible cutting across the lower part of the image, along with a massive network of trenches and thousands of shell craters. In the top left-hand corner the mine craters on the ridge can be seen; many of these date back to tunnelling operations here in 1915 and 1916, and some still survive today. More than another year of war was to come after this image was taken so that by the end of 1918 the whole landscape around the city of Ypres was a vast wilderness of shell holes and smashed ground where no-one lived again until well into the early 1920s. Only from the air can that true level of destruction really be grasped. This entry was posted on 09/03/2012 by sommecourt. It was filed under Battlefields, Belgium, Flanders, Great War, Tunnellers, Western Front, WW1, Ypres and was tagged with 1917, Bellewaarde, Passchendaele, RFC, WW1, Ypres.